With the holidays behind us, I am repeating a time-honored tradition at the start of this year. Having consumed the better portion of my own weight in cookies, chocolate, and heavy meals, I am ready to get back to a normal, heavy-on-the-vegetables, lean protein, whole grain diet. Part of what I love about this time of year is the fact that I start to really crave greens and, in spite of the guilt I feel about leaving a big carbon footprint, I just can’t help myself at the grocery store produce section. Because my need for green vegetables is so strong, I am extra-willing to try new things over and over until I find a way in which I like them. I did this with collard greens long ago, and recently had the same kind of revival with brussels sprouts. This time around, I am kickin’ it with some rapini, which is also called broccoli rabe. Part of me has always been a bit wary of this vegetable, maybe because I have always been of the mind that there is no way you could improve on regular broccoli. However, once you taste this green (which looks much like the love child of broccoli and mustard greens), you’ll see what a different flavor it has from anything else you’ve eaten. A lovely friend of a friend, Michelle Maisto*, has written a marvelous book called The Gastronomy of Marriage, which is as much a love letter to food as it is to her husband. Her literary (and culinary) treatment of rapini really resonates with me, describing how she “[craves] bitter greens like a thirst,” and sharing an anecdote about trying to get her husband to enjoy rapini, which he politely eats and dislikes (much like the Bun). Maisto backs herself up with a tenet of Jeffrey Steingarten, food critic for Vogue, who claims that food aversions can be overcome with repeated consumption. Though I find Steingarten’s TV personality abhorrent, I do find some of his food philosophy insightful. 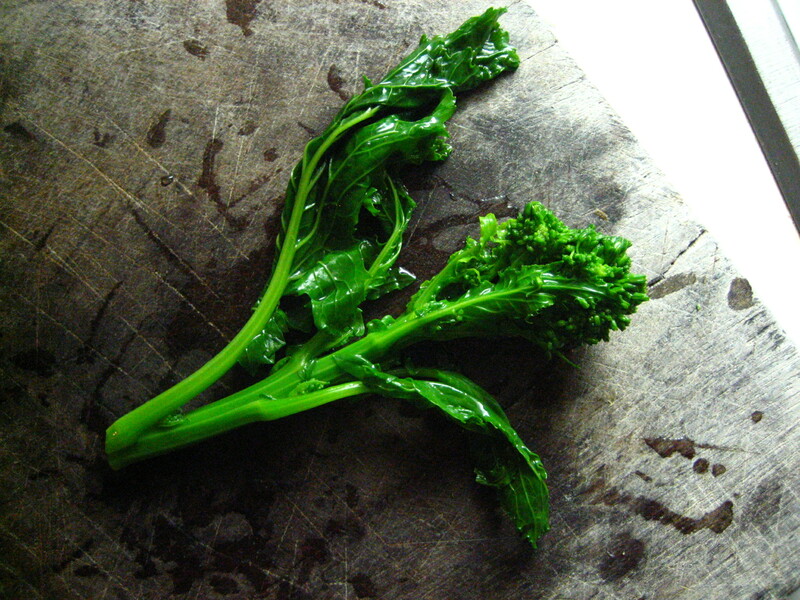 I prepared rapini for the first time with very negotiable results; I was discouraged, but also challenged. Foolishly, I treated the vegetable like broccoli and merely sauteed it in olive oil and garlic; the end product was bitter and unpleasant. The step I missed was the par-boiling step, which makes all the difference. Once blanched in some salted water, the rapini becomes gorgeously green (see photo), the color of green that you long for in the winter months. As Ms. Maisto suggests, finish the blanched rapini with quick saute in some olive oil, garlic, red pepper flakes, and a squeeze of lemon. This makes for the deepest, most verdant vegetable dish I’ve ever had. Please give this one a try with some seared salmon or roast chicken; you may not fit it into your standard rep right away, but it’ll be a flavor so compelling that you’ll inevitably return to it again. * Ms. Maisto also writes an exceptionally useful blog called The Market Report, which should be required reading for all New Yorkers.